Amazon revealed its first ever phone today. Dubbed the Fire Phone, it has all kinds of wild features like the head-tracking Dynamic Perspective, Firefly (for buying all the things), and all kinds of other bells and whistles. Novel stuff, but is it actually, y'know, good? We just went hands-on, and we're not too sure. The hardware itself is pretty decent. From the front it looks a bit like an iPhone 5, but with an odd dot at each of the four corners (the front-facing cameras). The screen looks quite nice, despite it only being 720p instead of the more standard 1080p on current flagship phones. Build quality felt nice and sturdy. It's solid, but not particularly heavy, and it didn't feel like it creaked. The sides are rubberized for increased grippiness, and the back is (unfortunately) smooth and glassy, which made it feel like it'd slide off your leg despite the rubber sides. Also, and not to be shallow, but the phone itself just isn't very attractive. It's no thicker than the HTC One (M8) is at its thickest point, but the One is rounded which makes it feel a lot thinner. It seems that design aesthetics were a definite afterthought, and it's just kind of plain. One might go as far as to say it's a bit ugly. I only was able to play with the camera for a brief moment, but it seemed to react to my pretty quickly, and photos looked pretty good, though there may have been some dynamic range trouble. It does have an HDR mode, though, so perhaps that could be worked out. The speakers (which are supposedly Dolby Surround) sounded tinny and were very disappointing from my initial listen, especially given that Kindle tablets have had stand-out audio. I was impressed that it didn't freak out when two faces were in front of it. It dynamically switches between which face it's exhibiting toward, and it's more seamless than I would ahve thought. And if your heads are close enough together it doesn't really matter which one it's geared toward. The effect is basically the same for both of you. But is it useful? It doesn't really seem to be, or at least not yet. Jeff Bezos and Amazon's demo crew really tried to tout its utility. In maps you can move your head side to side to toggle overlaid information on and off. You can tilt the phone in Amazon's store to zoom in on an item, or tilt it a little further to see it from the back. It doesn't ultimately seem more intuitive that tapping on the screen, which we're all already used to. It was also intermittently buggy. It's not final software, but it would occasionally skip a bit, or text would appear blurry because it was "aimed" away from your face. Tilts weren't always recognized, and our demo guy would often resort to using his finger, which you can still use for most things, thankfully. I played a couple of games that use head tracking for control, and they struggled with accuracy and bugs (like, just not recognizing what I was trying to do at all). It wasn't a more fun or more immersive way to play these games. In fact, it was more awkward and less comfortable. There's also the problem that developers who already have popular apps will have to redevelop them to take advantage of Dynamic Perspective. Will they? I can't imagine they'll have much motivation to do so. Maybe someone will do something cool with it, but ultimately it really just comes off like a gimmick. We wanted to like it, but so far it really just doesn't seem to add much utility. There's simply no way around this: The software doesn't measure up to iOS, Android, or Windows Phone. In fact, it seems way behind. The operating system is called Fire 3.5, which is based on a forked version of Android 4.2.2, but Bluetooth Low Energy (BLE) support wasn't added to Android until 4.3. This means that you can't use Fitbits, heart rate monitors, or a lot of other modern Bluetooth accessories. The hardware supports it, and Amazon says it will be coming when they update Fire OS to a version based on 4.4, but there is no timeline for when that will be. Some aspects of the UI do look very nice. We like the ability to pin content to the home screen, and getting a quick preview of the most recent few emails in your inbox looked really good. Bezos demonstrated some actions that you could perform on them straight from that view, but we were told that won't be available at launch. Then there's the maps situation. 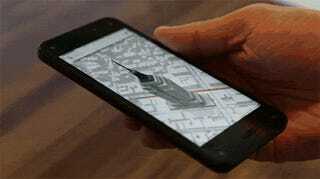 Amazon maps is based on data from Nokia's HERE map program, but the rendering et al is built by Amazon. It looks kinda cool with Dynamic View (hey, look, the buildings are 3D), and it offers turn-by-turn directions, but there are no public transit directions or data. This is going to be a deal-breaker for a lot of people. Amazon said they're "working on it," but again, no timeline is given for inclusion. UPDATE: Amazon reached out to tell us that, contrary to what we were told at the event, transit directions will be included in maps. Good! There's also no multitasking, which all of the other major OSes include now. That means there's no quick and easy way to flip back into the app you were just using. You have to hit the home button, and find it again through the Carousel view or the Grid view. This seems like a 101 feature at this point, and it's not here. UPDATE: While there was no task switcher in our demo, Amazon has just confirmed that it should be integrated into the software by the time the phone launches. That, plus the maps above should take care of two of our biggest complaints. It's also just not particularly intuitive. You can switch back and forth between grid and carousel views, and you can also tilt to the right and get to a list of important apps (which you can't customize). Seems kind of redundant and confusing. Tilt over from the right and you get a kind of at-a-glance view of some stuff Amazon thinks might be important to you, like the weather where you are, and your upcoming appointments, and apps you might want to buy. It's not a Google Now, analog, though, and nothing is really customized to you (aside from the appointments and weather). Again, it just seems like it's in the nascent stages of development. One of the exceptions on the software side was Firefly, which Amazon clearly spent a ton of time on, for the maybe obvious reason that it stands to benefit Amazon the most. In our demo, the company had set up a whole wall of products for us to ogle with the app, and it was incredible how fast it worked, adding various items to the list and making it easy to purchase them from Amazon. Not only was it effective, it was kind of beautiful. You have these sparkling fireflies that swarm around your screen and then highlight relevant stuff when they find it. It worked on most physical products in their packaging (though not my naked Canon 6D), and it pulled relevant data from real estate signs. It also was able to identify The Matrix as it was playing on a TV, and even tell us what minute the movie was at. It worked the same on music coming out of a nearby speaker. Definitely slick. This was the most successful of Amazon's efforts, and obviously, Amazon stands to benefit a lot from it, since it's a serious enabler for buying stuff through Amazon (though you can also find music through other apps you have installed on the phone). We were excited about the phone coming into our hands-on, but ultimately, we walked away feeling somewhat unenthusiastic about it. It comes off as a little gimmicky, and it's missing some features that would make it competitive with phones from the three major operating systems. And I'm not sure that Fire exclusive features like Dynamic Perspective and the Mayday button will be enough to make up for it. The biggest impression one's left with is that Amazon poured the bulk of its resources into the part of the Fire phone—that's Firefly—that makes it easiest for you to buy things from Amazon. It makes perfect sense for the company to prioritize the thing that's going to help it the most down the line, and obviously future updates will focus on improving the overall UI. That doesn't make the absence of basic functions like multitasking and Bluetooth LE any less glaring. To be fair, we were playing with an early build and this thing doesn't hit the (online) shelves until late July, so we'll reserve full judgment until we get to do a full review. Our advice for now, though: Hold off on pre-ordering. Amazon's Fire HDX tablet is fantastic. The Fire Phone? We're less sure.